Who can get tired of dim sum? What used to be a traditional comfort food eaten with tea in China has gained momentum across the world, and has become one of the most beloved items in Cantonese cuisine. So, if you are craving some good old-fashioned dim sum, we bring you 10 of the best restaurants to satisfy even the fussiest of foodies. From the Taste Paradise Group comes Canton Paradise, a unique dining concept that introduces Singaporeans to authentic offerings from Shunde - a province in China, which is said to be origin of Cantonese cuisine foodies have grown to love. Hence, the restaurant’s menu consists of impressive items and dim sum selections including Steamed Pork Ribs and Prawns in Crispy Bean Curd Skin. Crystal Jade is a name that always comes to mind when one thinks of good and reputable Chinese food. It’s the same story when it comes to beloved dim sums. One of the group’s concepts, Crystal Jade Xiao Long Bao, is popular for its steamed Xiao Long Bao (hence, the name) and many more dim sums. The chefs continuously whip up new flavours to excite diners, two of which are the Chilli Crab Xiao Long Bao and Hainanese Chicken Rice Xiao Long Bao, available until September only. These new specials complement the classic dishes diners have grown to love at this restaurant. Hai Tien Lo’s kitchen has been helmed by Masterchef Lai Tong Ping for over a decade, assuring diners that the standards of food and cooking remain high. The same goes with his dim sums available during the Weekday Dim Sum Buffet. While retaining his classic favourites of Steamed Shrimp Dumplings, Minced and Steamed Barbecued Pork Buns and Steamed Xiao Long Bao, he has introduced new items to give more options to regular and new customers. Besides these offerings, you can also enjoy a complimentary serving of Chilled Homemade Beancurd with Bird’s Nest. Considered the go-to place for authentic Cantonese dishes in Orchard, Hua Ting continues to attract foodies with its Cantonese delicacies that are prepared by chefs from Hong Kong. Available only for lunch, diners can feast on their classical style dim sums, which include the Signature Baked Chicken and Mango Tart and Steamed Custard Bun with Salted Egg Yolk. It’s an all-you-can-eat affair at Peach Blossoms everyday. For brunch on weekdays and weekends, the restaurant’s talented culinary minds present customers with classical dim sums as well as soups, congees, mains and desserts. Giving customers more reasons to visit are the new creations like Poached Shrimp Dumpling in “Szechuan” Spicy Sauce and Pan-fried Foie Gras with Smoked Ducked served on Mantou. These are served on wheels, just like old times, to add to that nostalgic feeling. At Peach Garden, one of the longest running Cantonese restaurants in Singapore, diners are assured that the dim sums capture the essence of what the cuisine is all about: being filling and good for sharing. With the restaurant’s Dim Sum Weekend High Tea buffet, you can enjoy over 30 creations, some of which are the ever-famous Xiao Long Bao, Roast Pork Cube and Steamed Siew Mai with Crab Roe. Since 1995, Man Fu Yuan has been pleasing palates with its exquisite Cantonese offerings with foodies flocking to this restaurant to try out its beloved mains and dim sums. For the latter, the restaurant offers the Weekend Dim Sum Buffet, which gives dim sum lovers access to some of the chef’s best creations – Crystal Dumpling with Preserved Vegetables, Lobster Dumpling with ‘Jin Hua’ Ham and Minced Pork Dumpling with Scallops. Known as one of the go-to restaurants for exquisitely prepared dim sums, Wah Lok makes these goodies available for the lunch buffet only. But it’s worth the visit to enjoy signatures such as the Baked Barbecued Pork Buns and the Glutinous Rice wrapped with Lotus Leaf. Executive Chef Ng Wai Tong has uniquely prepared these items so you can have a taste of his famed Cantonese cooking. Dim sum lovers will be enthralled with Xin Cuisine’s special offerings, which are made by its special, in-house dim sum Chef. 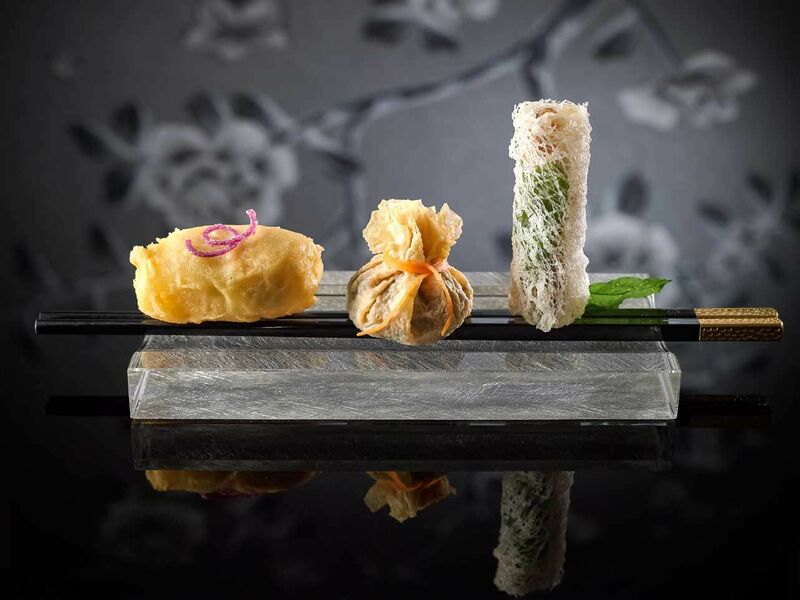 With over 25 years of experience in Cantonese cuisine, he has mastered the art of cooking these delicate nibbles. Elegantly served are his popular items of Barbecued Suckling Pig with Foie Gras, Yam and Japanese Cucumber and Pan-fried and Three Mushrooms with Pommery Mustard Sauce. Though with a slight twist to the classical recipes, you can be assured that these remain authentic Cantonese dim sums. Every weekend and public holidays, Yan Ting serves a slew of Cantonese creations with its Dim Sum Weekend Brunch. On these days, guests can have their fill of over 80 dim sum favourites, some of these are the Steamed Barbecued Pork Honey Glazed Bun ‘Char Siew Bao’ and the Xiao Long Bao. If you can’t decide, the restaurant also offers a set menu with its signature items. There’s an option to top up for free flow beverages as well as champagne.